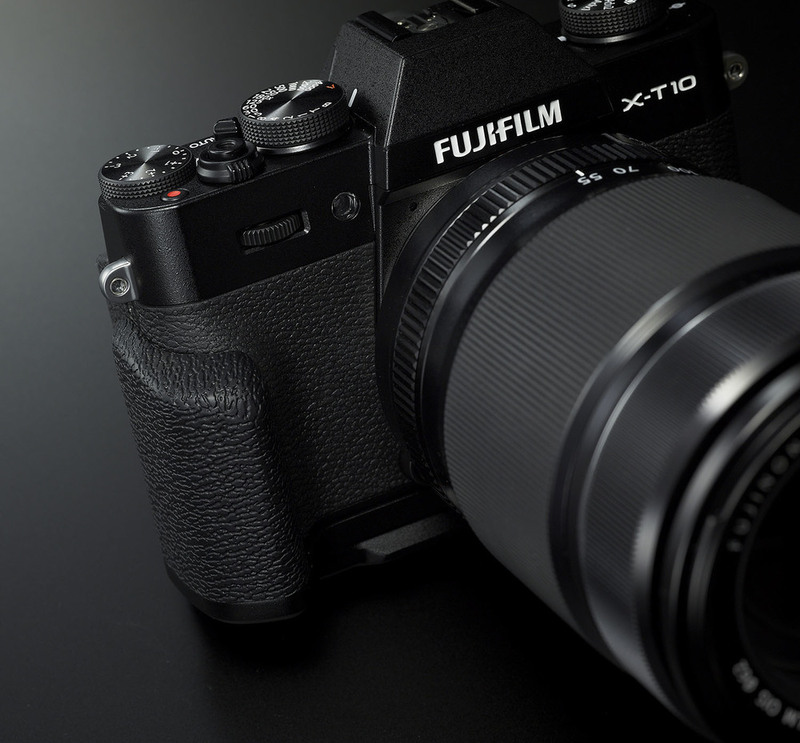 If you’ve been thinking about a second X-T1 body, now would be a great time. The reason comes down to how Fujifilm operates. Each camera moniker (X-E, X-T, X-Pro, X100, etc.) has its own team, so the feature set of the X-T10 and X-T1’s firmware are done by the same team, whereas the X-E2’s firmware update would be implemented by another. Originally I thought the optical viewfinder might be the reason for the delay, but apparently that’s not the case. There does seem to be some technical limitations to the OVF,1 however multi-point AF, Zone, Tracking/Wide are not among them. If Zone and Tracking/Wide are going to be added to the X100T though, the number of selectable AF areas should also be increased. Currently, only a 5 × 5 grid is selectable for autofocus in the optical viewfinder as compared to the EVF/LCD, both of which offer a 7 × 7 grid of AF points. In both cases, the central 3 × 3 grid of AF areas are Phase Detect enabled. 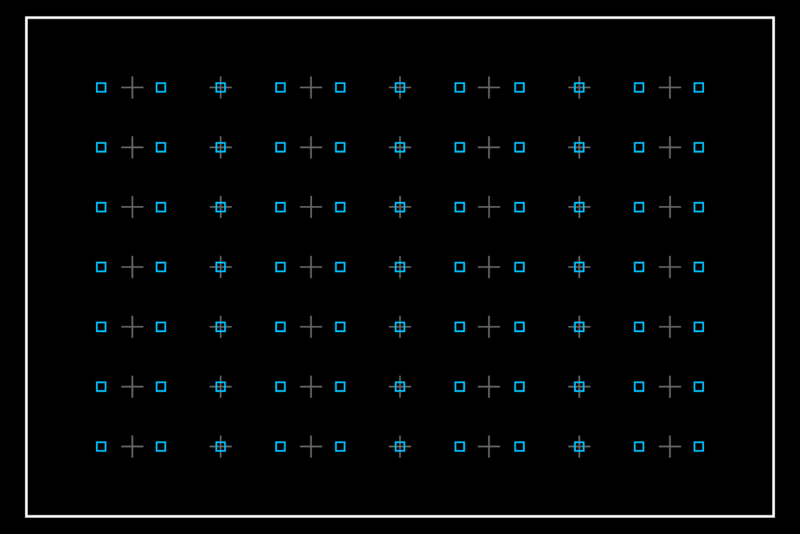 This means that 5 × 5 Zone and Wide/Tracking would behave almost the same when the OVF is selected unless single area selection remains a 5 × 5 grid, and the new autofocus system uses an expanded 11 × 7 grid in the OVF. 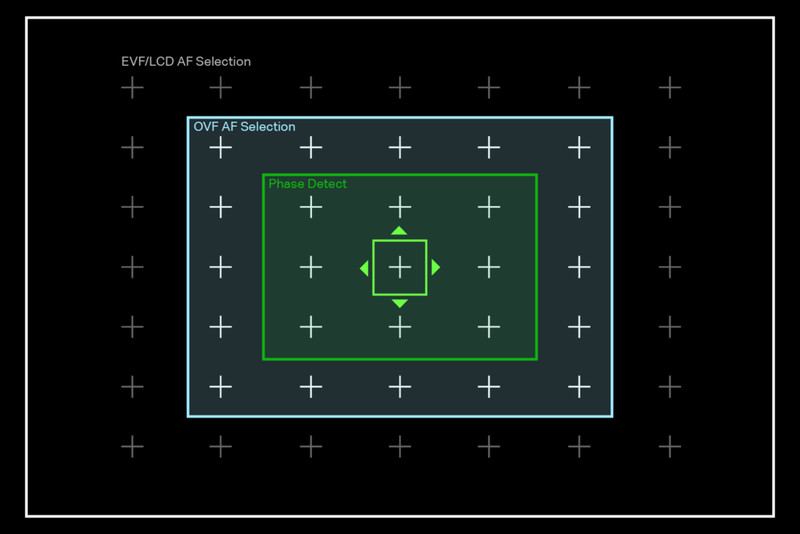 Either way, it would present a UX nightmare or be even more confusing than having different numbers of AF points available between the EVF and OVF.3 The obvious solution is to expand the number of AF areas in the OVF to the same 7 × 7 grid for consistency. Fuji has to be working out a solution to this though if an X-Pro2 is going to have an optical viewfinder, and arrive with at least as sophisticated an autofocus system as the X-T10 has. OVF users won’t want their preferred method of composition crippled, so hopefully one of those teams gets things figured out soon. I’m missing the new autofocus system on my X100T already. The choice between a new X-T10 and the X-E2 has become a little more tricky. At least, it will be sometime soon-ish. Fujifilm has confirmed another firmware update for the X-E2. In my comparison, I posited that the X-E2 was probably end-of-life as far as firmware upgrades are concerned. Turns out I was wrong, and I couldn’t be happier about that. My Versus piece saw a minor update to reflect the firmware news, and will be overhauled once the firmware’s feature set is at least officially announced. What’s of particular interest to me is how early days this is. All Fuji has said in any sort of on-the-record format is they’re planning an update, and will determine what is included in the update based on requests from users. I think it’s pretty safe to say the new AF features (multi-point, zone, wide/tracking, eye detection) will be included, but what about a UI update? Or a rotating EVF UI? Can Fuji please, for the love all that is good and pure, make the left and right function buttons customizable, and set playback to the LCD even when EVF-only has been chosen for composition? While the early nature of this announcement pacifies X-E2 owners and gives them something to look forward to, it also leaves us with no sense of when this update will be available. 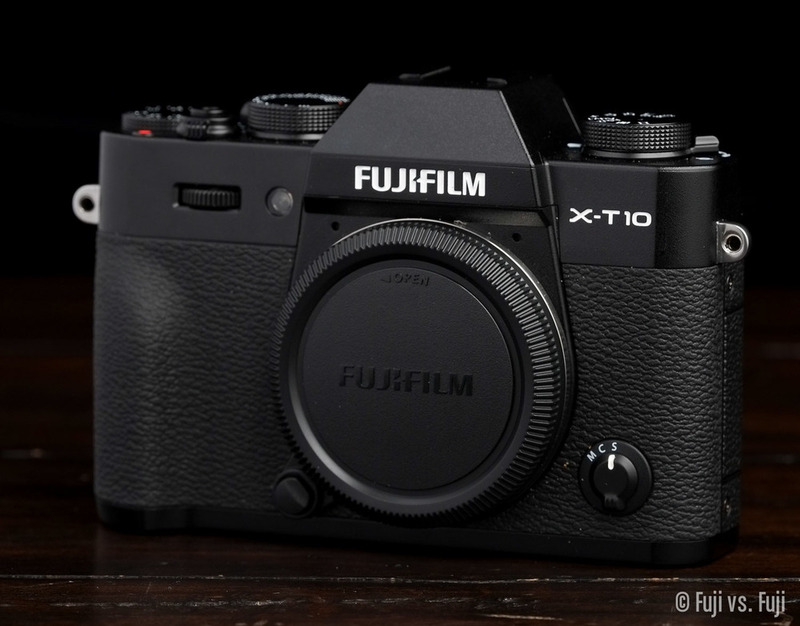 Most of the internet seems to think Fuji will intentionally impose a long delay as they will not want to cannibalize sales of their new X-T10, but I think a bigger reason for the wait will come down to the engineering resources Fuji has to put on the project. Would Fuji really be disappointed if people buy one Fuji camera body over another? Hardly. Having an X-E2 today with an untold wait time for the latest features at $100 less. Having an X-T10 in a few weeks with the latest features, and a few additional hardware niceties (tilt screen, dials and buttons) for $100 more. It’s nice to have these kinds of tough decisions. In my review and comparison, perhaps my biggest criticism with the camera was its grip, or lack thereof. This potential issue is easily addressed by way of a half case, or MHG-XT10 grip that also provides Arca Swiss tripod compatibility. Both maintain battery and SD card access, which is nice. Historically, I haven’t been thrilled with Fuji’s grips, and have preferred to attach a Really Right Stuff L-plate for my Arca Swiss needs, but this is a camera where a little added grip would do wonders. On the other hand, if the grip on the X-T10 is too small for you and you’re considering an MHG-XT10, the price of your X-T10 is now $930 (USD), just $270 less than the price of an X-T1. Less than $300 gets you a grip you’ll be more comfortable with out of the box, superior build, weather sealing, better continuous shooting, etc. If an X-T10 arrives in my home as an X-T1 owner already, it would be the sort of camera that would stay off the tripod for the most part, and this may be the first Fuji half case I test. Anyone want to send me a Luigi half case to compare? For my fellow Canadians—and I suppose my American friends who don’t mind the extra shipping costs—X-T10 preorders come with an official Fuji half case that would normally set you back $100 CDN. I have to say, this setup looks awfully sweet. 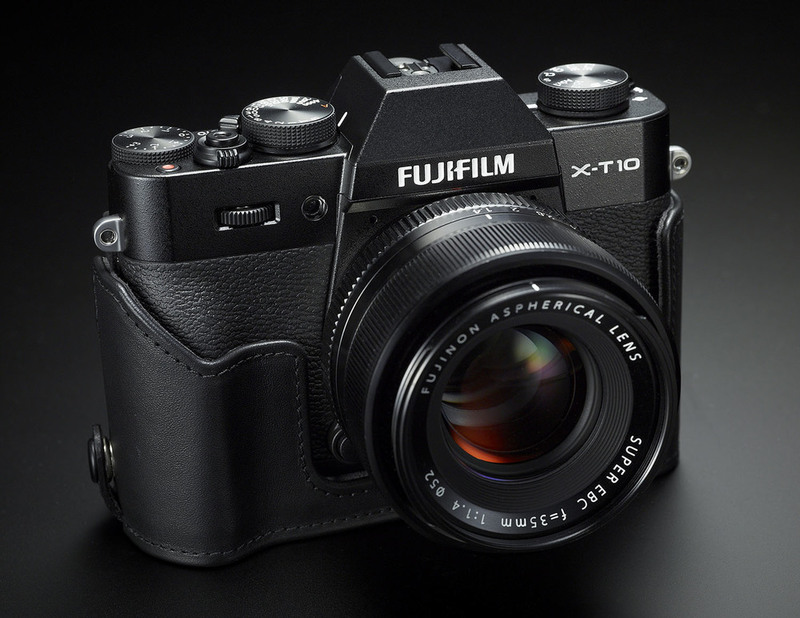 Fuji’s X-T10 with half case – Image courtesy of Fujifilm Canada. Fuji’s latest interchangeable X-Series camera has officially been announced, and Yours truly has had one for the last couple of weeks. Check out my thorough review here, and an extensive Versus piece where I compare the new X-T10 with the X-T1, and X-E2.